The ODT-ADS-12B8G-16 is a ultra-high performance RF sampling 12-bit 8 GSPS ADC in a standard 16nm CMOS process, implemented using Omni Design's groundbreaking low power SWIFT technology. 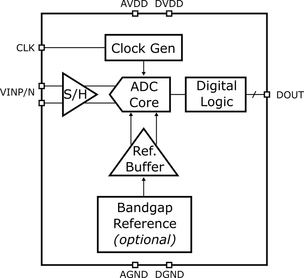 The ADC achieves low noise and excellent SFDR in a compact area. For ease of integration, an integrated bandgap voltage reference and reference buffer is included.